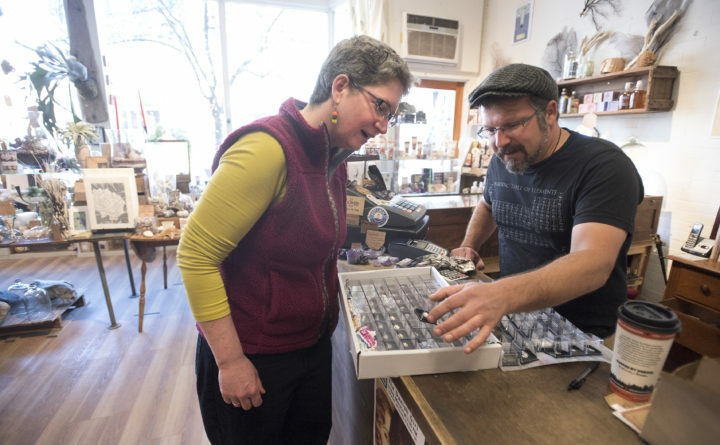 Kate Dickerson (left), founder of the Maine Science Festival, and Tony Sohns, co-owner of The Rock & Art Shop, check out a collection of each naturally occurring element that can be found on the Periodic Table of Elements in this Feb. 26, 2016, file photo. Tony Sohns, a collector of rare minerals and strange creatures whose ability to spot nature’s eccentricities found an outlet in the Rock and Art Shop, a popular set of stores in the Bangor region that he co-founded with his family, died last week while on a business trip to Arizona. Sohns, a 41-year-old Bucksport native who was known to many as “the Bug Man,” died after a heart attack, according to his obituary. Friends and family remembered Sohns as a teacher, storyteller and adventurer with an infectious enthusiasm for natural wonders, large and small, living and dead. Among the many curiosities that Sohns and his family have collected and kept in their stores are the cast of a Tyrannosaurus rex, a taxidermied ostrich, a deformed piglet with eight legs, a giant clam, an electric eel, a rat-eating plant and rocks that turn invisible when placed in water. He also had a pet emu. As a shop owner and educator, Sohns liked to draw audiences out of their comfort zones, helping them to find wonder and respect for creatures that their guts would tell them are icky. From an early age, Sohns collected rocks and bugs while exploring the shores of Silver Lake in Bucksport and going on yearly family camping trips to Baxter State Park, according to his obituary. While studying entomology at Oregon State University, he started Bug Mania, an educational program that he brought to Maine and continued to run. 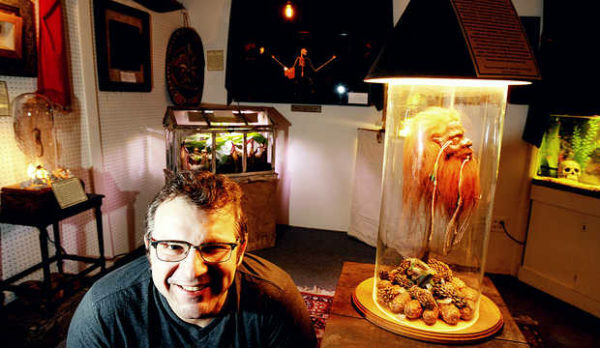 Tony Sohns, co-owner of The Rock & Art Shop, has such things on display as a shrunken head, the largest bat on Earth and a live electric eel at The Natural History Freak Show inside his Bangor shop. With his parents and siblings, Sohns helped start the Rock and Art Shop, a business that started in an orange building on Route 1A in Ellsworth and now consists of three stores in the downtowns of Bangor, Ellsworth and Bar Harbor. Throughout his life, Sohns also enjoyed going on adventures, whether it was to hunt for diamonds in upstate New York or deliver a truck to a friend across the country — as he did for Travis Clough, a close friend of Sohns since they attended Bucksport High School together. Clough recalled a time when they were younger and Sohns couldn’t find a tarantula that had left its cage. That experience would have been terrifying to Clough if Sohns wasn’t so familiar with the animals in his care. 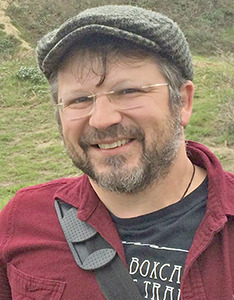 Sohns is survived by his mother and father, Arlene and James Sohns; his sisters, Amanda Sohns and Annette Dodd; his brother-in-law, Chris Dodd; and his nephew, Samuel James Sohns Dodd. A wake will be held for Sohns at Mitchell-Tweedie Funeral Home in Bucksport from 4 to 6 p.m. Friday, and his funeral service will be 10 a.m. Saturday at St. Vincent de Paul in Bucksport. Correction: An earlier version of this report misstated Travis Clough’s last name.